Darragh Fanning enjoyed a prolific European debut, but credited the win to his pack. Darragh Fanning combined well with Jimmy Gopperth to score his first European try. THE LEINSTER BACKLINE might be missing a bit of magic through injuries and retirements but you can’t say that people haven’t stepped up. Leinster were two scores behind twice against Wasps yesterday – both times after handing the visitors easy scores – but twice wing Darragh Fanning touched down to start a Leinster fightback. The former St Mary’s wing mightn’t have the bamboozling ability of Isa Nacewa or Luke Fitzgerald, but his physical running style has paid dividend for Leinster in recent weeks as Fanning also blasted over after a nice running line against Munster. His first score yesterday came from a deft Jimmy Gopperth grubber and there wasn’t much going through Fanning’s head as he waited for the ball to bounce kindly. “I don’t know [what he was thinking], just catch it or Matt will kill me,” Fanning said. His second score also came at a crucial time for Leinster right after half-time, but Fanning was happy to give the credit to Gordon D’Arcy for his herculean rucking. “I think my eyes just lit up when I saw the tryline” Fanning said. Fanning’s two scores were a just reward for the amount of work done up front as Jamie Heaslip lead the Leinster pack in both tackles and carries. Fanning matter-of-factly mentioned his brace afterwards but preferred to heap praise on a forward unit that had responded well from their annihilation against Munster. “It’s obviously great to make my European debut and get a couple of tries but that win definitely came through our forwards,” Fanning said. Fanning also added that he, in particular, had benefited from an intensive pre-season regimen. “A year in the Leinster environment has brought me on massively,” Fanning said. “I got a full pre-season this year, which I didn’t get last year. My pre-season last year was like two weeks. With the absences – some permanent – of Sexton, Nacewa, O’Driscoll, Fitzgerald, Healy and O’Brien, there is no doubt that this Leinster team isn’t as potent as they once were. But Fanning says that the confidence brought by consistent success still permeates the squad, and they can draw on it when they are behind in a close encounter. 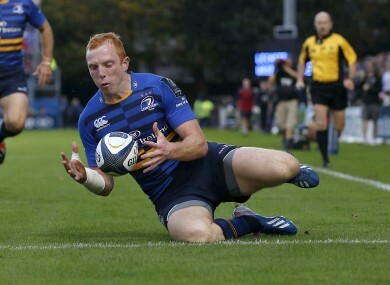 “No matter the score, I always feel confident in the Leinster team,” Fanning said. Leinster travel to Castres this weekend for their second pool game and they can fly to France with confidence having won their penultimate group game at the same venue last year. Winning away in Europe is always hard, but if the first weekend of the condensed Champions Cup is anything to go by, it could be nigh on impossible in the new tournament. “Munster were the only team to win away this weekend so being at home is a massive advantage in Europe and it is going to be tough for us next week,” Fanning said. Email “'Just catch it or Matt will kill me' - Fanning happy with brace but stresses team effort”. Feedback on “'Just catch it or Matt will kill me' - Fanning happy with brace but stresses team effort”.